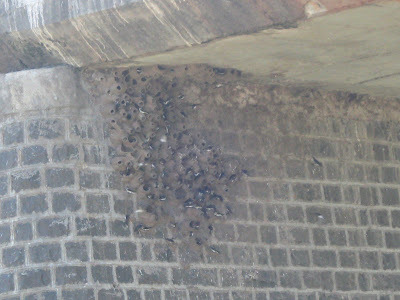 And now, on our trip to Morachi Chincholi, we stopped by a river to dip our feet in the cool water, and what do I see, but a group of swifts flying hither and thither, and under a bridge, a cluster of their nests!! What a sight! I was happy to show off my knowledge, and we began clicking photos.... Of course, we couldn't get any closer thanks to the water, and this is the best I could do! 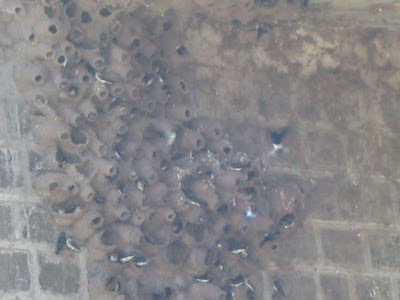 Hoping that my tryst with swifts continues in the future too... and not just with swifts, but with other birds too!! Life is like that. All good wishes. It is still very beautiful. And I usually get to see the other Swift, the Maruti Swift! Oh.. that must have been beautiful..
Oh! To see them so close! How lucky! This is really interesting! Never seen this before.